Worker Rights Under Executive Order 13658: Federal Minimum Wage for Contractors – $10.35 per hour effective 1/1/2018. Tipped wage – $7.25 per hour. 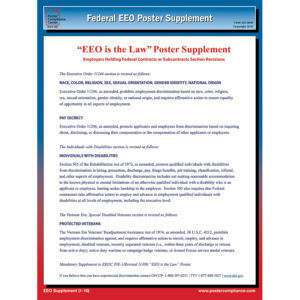 Purchase Poster Compliance Center’s Federal Contractor Poster to receive all mandatory posting notices listed above. 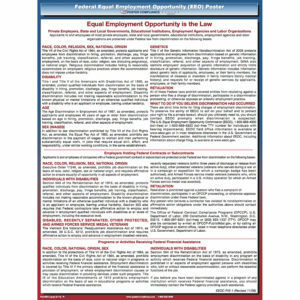 Federal contractors and subcontractors are required to inform employees of their rights under the National Labor Relations Act (NLRA), the primary law governing relations between unions and employers in the private sector. 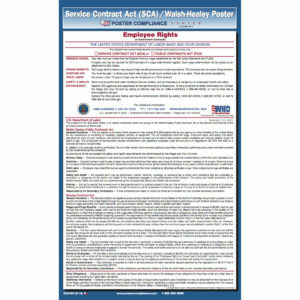 Covered federal contractors and subcontractors are required to post this federal labor law poster conspicuously in plants and offices where employees covered by the NLRA perform contract-related activity, including all places where notices to employees are customarily posted both physically and electronically. This poster is required under Executive Order (E.O.) 13496 signed by President Barack Obama on January 30, 2009.